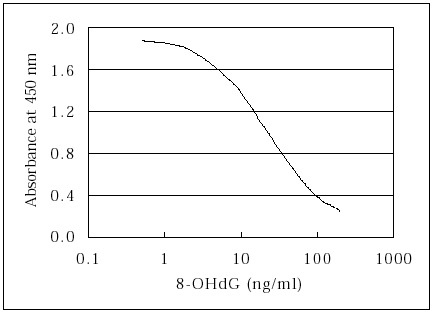 8-Hydroxy-2’-deoxyguanosine (8-OHdG) is excised during the repair of oxidative damage to dG sites in DNA and has been widely used as a biomarker for oxidative damage. This competitive ELISA kits employs a monoclonal antibody specific for 8-OHdG quantification in tissue, serum, plasma or urine samples. Each kit contains sufficient reagents and standards for the replicate quantification of 8-OhdG in up to 18 samples. Results are read at 450 nm on a microplate reader. 1. Cutler RG. Am.J.Clin.Nutr. 50:373S-379S, 1991. 2 Kasai H et al. Carcinogenesis 7:1849-51, 1986. 3. Fraga CG et al. Proc.Natl.Acad. Sci.USA 87:4533-4537, 1990. 4. Shigenaga MK, Ames BN. Free Rad Biology and Medicine 10:211-6, 1991. 5. Kantha SS et al. Biochem.Biophys. Res.Comm. 223:278-82, 1996. 6. S. Toyokuni et al. Osawa. Lab.Invest. 76:365-74, 1997. 7. M. Erhola et al. FEBS Letters 40:287-91, 1997.